With an average of 250 resumes received for each corporate job opening — and the average length of unemployment still hovering at 37 weeks — job seekers need all the help they can get when it comes to landing a new position. Competition reports allow job seekers to gain insight on other applicants, including top skills, degrees, and years of experience. Applicants can see where they fall within the employer’s application period, whether they were the first resume submitted or resume 250. Application status updates let job seekers easily determine where they are in the application process. Finance professionals can see when their application was viewed and if they made the employer’s shortlist. 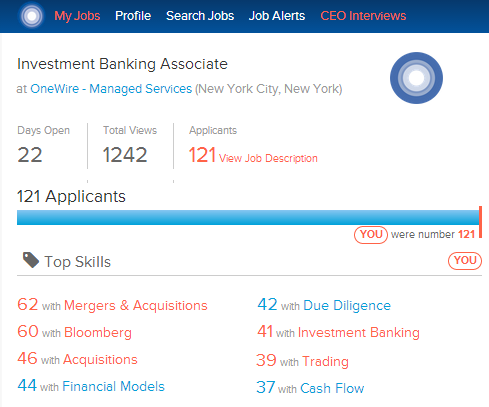 Edge candidate profiles receive the highest level of visibility across OneWire. With premium status, candidates are highlighted when an employer runs a search, while premium placement allows Edge candidates to jump to the very top of the employer’s applicant list. Edge provides insight into which firms are viewing your profile, and sends instant alerts when relevant jobs are posted to enable you to apply before anyone else. Instant job alerts allow Edge users to be the first to know when new, relevant jobs are posted allowing them to apply well before anyone else. Are you on OneWire? Have you tried Edge? Please let us know what you think in the comments below!